Look out for Sidney Brown’s weekly dispatches from the front lines of Blackhawks fandom every week during the hockey season. While continuing to form its identity, this year’s Chicago Blackhawks squad has two areas of development that have shown progress and that are standing out like Jonathan Toews (aka Captain Serious) on the stage at Second City. One is the penalty kill. This unit of the Hawks’ special teams has only given up two goals since the first week of the season. At the same, this group has had to work more than they probably should because of players taking penalties at critical stages in games. Players like Andrew Shaw and Brandon Bollig still need to learn how to play under control while intimidating the opposition and not let their emotions get the best of them. The Hawks penalty kill is ranked 28th in the league (73.1 percent) but that is an improvement from the previous week. Secondly, the team’s power play attack, currently ranked 12th in the NHL (20.0%), is also looking encouraging. The goals aren’t necessarily coming at the pace that we fans are used to seeing, but its been clear seeing the Hawks execute more patiently and them waiting for plays to develop. Evident in last Saturday’s win over the Toronto Maple Leafs, this offensive philosophy paid off when Hawks rookie Brandon Pirri scored his second goal of the year late in the third period, securing a 3-1 victory. 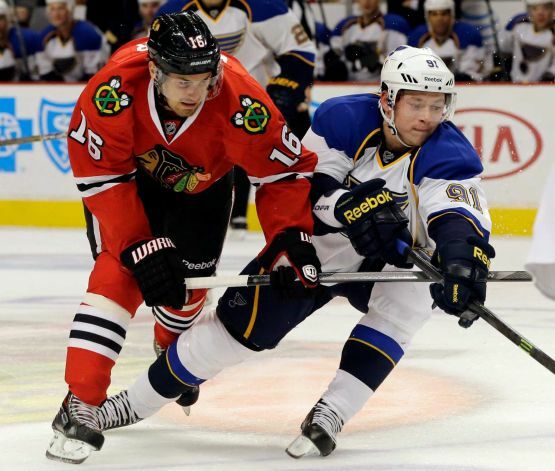 The St. Louis Blues’ Vladimir Tarasenko chases the puck as he battles against the Blackhawks’ Marcus Kruger (16) during the first period last Thursday at the United Center. The Hawks were victorious in two of their three games last week, but they saw some sturdy competition once again from a team that could be a nuisance throughout the season — the St. Louis Blues. The Blues have taken the first two meetings from the Hawks in this early season, most recently winning 3-2 in a shootout on Thursday. The Blues have talent but I still am not confident they can match the Hawks skill-wise. St. Louis’s strategy is to knock you around with hard hits for 60 minutes and they’ve been successful in doing so thus far. If the Hawks want to repeat as champions, or even just survive the Western Conference bracket of the playoffs, beating the Blues is looking more like a requirement. The Hawks record stands at 5-1-2 entering this week and three of their five remaining games for the month of October are on the road with three of those teams from the Eastern Conference. The Hawks better collect the points now because the schedule gets tougher as we turn the calendar towards November. *Blackhawks winger Patrick Sharp scored his 200th career goal in a 3-2 victory at Carolina Tuesday. *Nothing like the first time: Rookie Brandon Pirri scored his first career goal Thursday versus St. Louis and Mike Kostka reached the same milestone in the Hawks’ 3-1 win over Toronto. *With their victory over Carolina, the Hawks collected their 2,500th win, which ranks the franchise sixth all-time in the NHL. Team Leaders: Goals — Patrick Kane (4); Assists — Niklas Hjalmarsson (5); Points — Brandon Saad (6). Goalies: Corey Crawford (4-1-2 record, .922 save percentage, 2.07 Goals Against Average); Nikolai Khabibulin (1-0, .895%, 2.00 GAA).